The General Sherman Incident refers to hostilities between the SS General Sherman and Korea in Pyongyang, Korea, 1866. The battle occurred incidental to the mission of the General Sherman to attempt to open trade for a British company based in Tientsin, China. Curiously, although the General Sherman hoisted an American flag, and the incident became a cause of concern for the United States government, the only two United States citizens on the ship were the captain and chief mate. 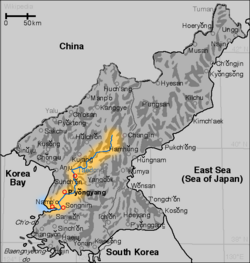 The Joseon Dynasty on the Korean peninsula sought to maintain a low profile during its later period because it had suffered devasting wars on its soil in the late 1500s when invading Japanese laid waste to the country during two invasions between 1592 and 1598, and a few generations later, 1627-1637, when the Manchus invaded devasting the nation once again. The Joseon dynasty, inaugurated in 1392, never fully recovered from that one-two punch. As a result, from the 1640s on, Joseon Korea increasingly sought to make itself inconspicious on the world stage. It depended on its small size as a protection and earned the name "The Hermit Kingdom." The royal court sought to make Korea appear as unattractive as possible from the coast and passed a law that prohibited the return of shipwrecked seaman, especially European seamen, to their native countries. As much as possible, Joseon sought to keep the secret of its attractive kingdom from the world beyond China and Japan. That especially became the case in the mid-1800s when Europe and the United States began to rove East Asia in search of colonies and markets. 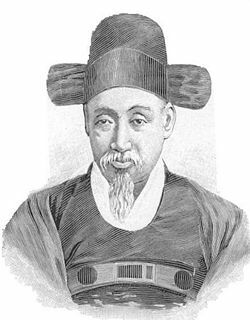 From the 1800s, Joseon Korea sought to conduct all diplomacy with Western nations through China. China, although wanting tribute from Korea, sought to hand off responsibility for Korea's actions, as in the General Sherman incident, to the Koreans. As early as 1840 Korea had engaged in discussions to open trade relationships with the United States; in 1844 the United States Congress shelved a draft due to lack of interest. The first contact between the United States and Korea proved peaceful. In 1853 the USS South America, an American gunboat, visited Busan on the southern coast for ten days and had amiable contact with local Korean officials. Several Americans shipwrecked on Korea in 1855 and 1865 received good treatment, traveling to China for repatriation. 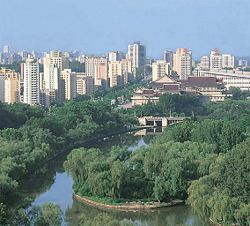 General View of Pyongyang from Daedong River. From the 1850s, Korea witnessed the inability of China and Japan to protect themselves from Western navies and armies. Japan opened to trade after Commodore Matthew Perry sailed into Uraga Harbor near Edo (modern Tokyo) on July 8, 1853 and, through the threat of attack, forced Japan to sign the Convention of Kanagawa in 1854. The Joseon court observed the colonization of China and the Opium Wars there with grave concern. That placed Korea in an even more insecure and defensive posture. China, Japan, and Korea had to decide upon policy to deal with Western superior firepower and armed forces. Either adopt Western technology and ways of government or reject them. Either embrace the new and reject the old, or embrace the old and reject new. From 1854 to 1866, Japan struggled with that issue, deciding to embrace the new with the Meiji Restoration and setting out on a course to fully modernize Japanese society and government. China and Korea, although in turmoil too over the issue, decided to embrace the old. The wholesale slaughter of Christians in Korea during the early 1800s constituted a purge of a minority party in the royal court more than an attack on Western influence. In 1866, though, the brutual execution of countless Korean Christians (some accounts name 10,000) by the government of the ruling Joseon monarch, Daewongun, clearly constituted an attempt to protect the country from the new, Western influence. The Daewongun's persecution of Catholics, including a number of French Jesuit priests, led to a reprisal by the French that same year. The General Sherman sailed on the scene with that backdrop. 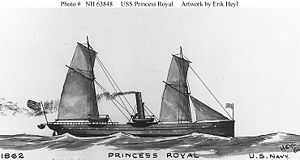 Despite the tension of recent events in Korea, the British company Meadows and Co. hired the the ship Princess Royal to make at trip to Pyongyang, Korea, in an attempt to meet with Korean officials to begin negotiations for a trade treaty. The 187-ton side-wheel schooner, well armored with two 12-inch canon, carried a cargo of cotton, tin, and glass. Curiously, even though only Captain Page and Chief Mate Wilson hailed from the United States, that was enough for the Princess Royal to come under the United States flag with the new name SS General Sherman just before sailing. In effect, the General Sherman went on the exploratory venture under British initiative, not American. Two other westerners sailed aboard the General Sherman, the ship's owner, W. B. Preston, a British trader, and Robert Jerman Thomas, a Welsh Protestant missionary obstensibly serving as a translator. The venture hired thirteen Chinese and three Malay crew to handle the ship. They departed Chefoo (present day Yantai), China on August 6, and on August 16, 1866 entered the Taedong River on Korea's west coast sailing upriver toward Pyongyang. The depth of the Taedong River changed frequently due to rains and the tides, but the ship navigated it successfully, stopping at the Keupsa Gate at the border between Pyungan and Hwanghae provinces. Tension mounted as the General Sherman crew waited for the Korean leaders reply. On August 27 Captain Page invited the Korean official, Yi Hong-ik, aboard the General Sherman, kidnapping him. (Some accounts state that a party of the ship's crew attempted to leave the vessel in a small boat, which was then pursued by Yi Hong-ik, resulting in his captivity aboard the General Sherman.) A day or two later, the Daewongun's reply reached Governor Park: "Tell them to leave at once. If they do not obey, kill them." By that time, the General Sherman found itself stranded on a sandbar in the normal flow of the Tae-dong River. Leaving was no longer an option. The Korean accounts of events from this point are confused. All accounts agree that the General Sherman fired canon into soldiers and civilians on shore, killing a dozen soldiers and many civilians on August 31. 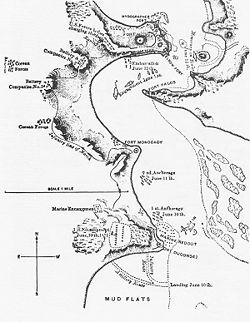 Battle raged for four days between the soldiers shooting fire arrows and the civilians throwing rocks while the ship's crew returned canon fire. The General Sherman, stranded without means to withdraw, seemed destined to fight to the finish. Time favored the Koreans. Governor Park ordered Panokseon or Turtle ships to attack, accounts read. Although excellent fighting ships in the 1500s against the Japanese wooden fleet, they proved ineffective against the iron schooner's armor plates. They resorted to another tried and proven technique, fire ships. Tying two small boats together, set ablaze, the Koreans drifted them toward the General Sherman. The third try worked, setting the ship ablaze. Many of the Chinese and Malay crew perished in the flames, others jumped into the river, swam to shore, were captured and beatened to death. The Americans, British, and Welshman met the same fate. The Korean official, Yi Hong-ik, escaped and safely made his way to shore. Reports reached the United States that the SS General Sherman had been lost with all its crew killed in Pyongyang, Korea. The navy dispatched Admiral Robert Wilson Shufeldt to investigate. He traveled to Korea, interviewed Korean officials, and left entirely dissatisfied with the "stone wall" of non-cooperation that he encountered. About the same time as the destruction of the SS General Sherman, the Daewongun conducted a mass execution of Korean Christians and several French Jesuit Priests. Admiral Rose, commander of the French Asiatic fleet, requested Admiral Shufeldt to join in a punative expedition against Korea. after Shufeldt declined, Admiral Rose carryied out the action with French naval forces in 1866. Shufeldt's recommendations led to a United States expedition in force to receive a more accurate account, apology, and make recovery of survivors and/or remains of the American, British, and Welsh citizens. Admiral Rodgers conducted the expedition in 1871, capturing Kangwha Island before withdrawing. In both the French and American expeditions, the Daewongun interpreted the withdrawals as defeats, emboldening him on the course of repelling Western navies and armies. Little did he know that his greatest foe would come from East Asia, Japan, and not the West. 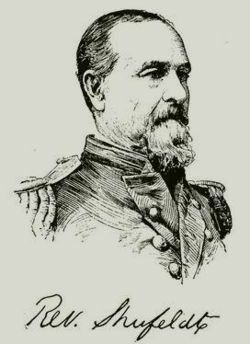 Admiral Shufeldt, rather than being disheartened by the destruction of the SS General Sherman and the United States Expedition against Korea in 1871, actually saw the conflicts as openings to negotiate a treaty with the United States. He persisted for more than a decade, finally succeeding in concluding a treaty between Korea and the United States in 1882. By that time, King Gojong and Queen Min had taken over the reins of government from Gojong's father, the Daewongun. King Gojong, and especially Queen Min, had Progressive leanings. The United States treaty with Korea opened diplomatic relations as well as permitted teachers (i.e., Protestant Missionaries) and businessmen to live and work in Korea. ↑ Wales Evangelical Christian website "Wales and Korea" Retrieved November 10, 2007. ↑ HomeofHeroes website"The Hermit Kingdom and the General Sherman Incident." Retrieved November 9, 2007. ↑ Ibid. Retrieved November 9, 2007. ↑ Ibid..Retrieved November 9, 2007. ↑ Vic Socotra"Capture the Flag" Retrieved November 10, 2007. Drake, Frederick C. 1984. The empire of the seas: a biography of Rear Admiral Robert Wilson Shufeldt, USN. Honolulu: University of Hawaii Press. ISBN 9780824808464. Association for Asian Research: The early US-Korea relations, Excerpt from "A Brief History of the US-Korea Relations Prior to 1945," Kim Young-Sik, Ph.D. 7/25/2003. History of "General Sherman incident"
This page was last modified on 25 May 2017, at 16:35.